Formes Alutek part of LDG Group LTD is proud announce that Queens Court is to be recognised with an International Green Apple Award for Built Environment and Architectural Heritage. Queens Court comprises 13 two-bed and four one-bed flats designed by local architect Denovo Design and constructed by Forrest on behalf of Halton Housing Trust. The architect wanted to celebrate the site’s musical history as they were commissioned to design affordable social housing for Halton Housing Trust. The apartments have special acoustic double glazed aluminum framed windows to help to reduce any external noise, and also have their own ventilation system to boost air quality which were manufactured at our Elsmere Port factory. Some of the world’s most famous band’s including the Beatles, Stone Roses and Happy Mondays have performed at Queens Hall. 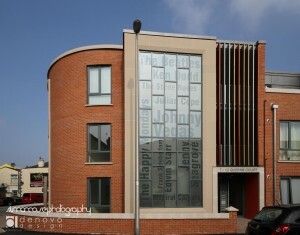 The curtain walling has manifestation with their names running up the side of the building, facing the main staircase. Colorful guitar string louvres representing the strings of a musical instrument are a striking feature above each of the entrances. The splashes of gold, silver and bronze depict a royal reference to the Queen. Formes Alutek was appointed to supply and install 146 Aluminum Windows and 17 Aluminum Doors, 3 Curtain Wall Screens. Our fitting teams were on site between September and November 2014. The award will be presented at the Empire Casino in London’s Leicester Square on Monday 29th June 2015.